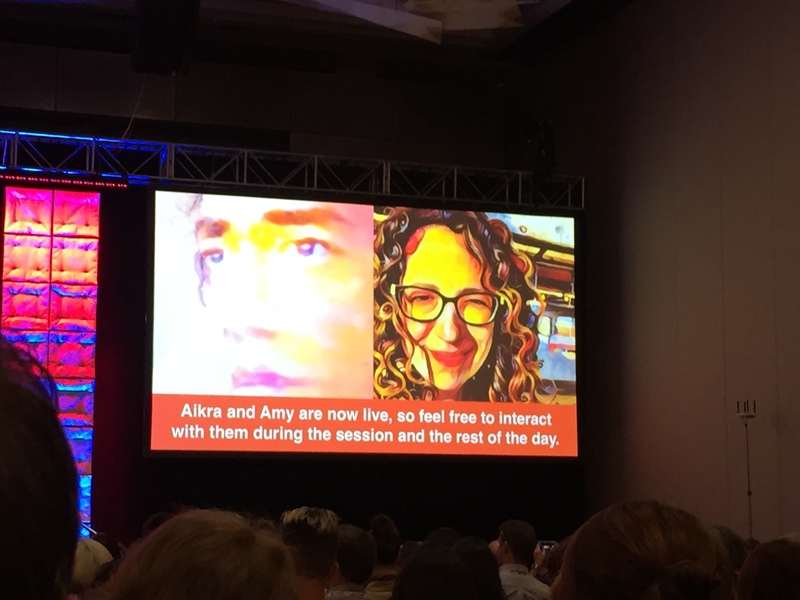 News robots, social video and distributed content were among key ideas for journalism educators at the Online News Association conference in Denver last week. The conference focused on digital ideas in an environment where journalism students and new employees with traditional storytelling skills are seen as assets to companies from CNN to NowThis News — as long as they also have the digital skills to take their stories beyond common platforms and approaches. This year’s gathering drew more than 2,100 people. Students (and professors) who enjoy using social media will be excited about the trend of distributed content in news. One huge theme at ONA this year was that news is being published for specific social platforms to the point that some news organizations are doing away with their home pages. One case in point is NowThis News. 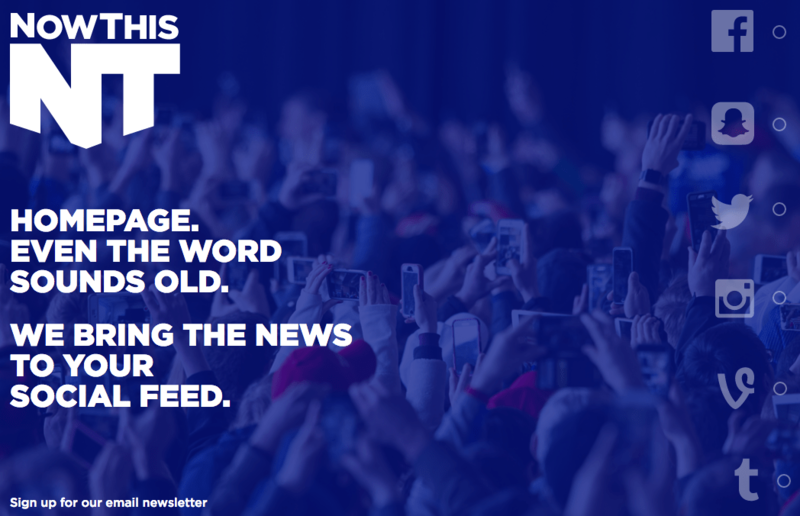 When users navigate to nowthisnews.com, they can follow NowThis on Facebook, Snapchat, Twitter, Instagram, Vine and Tumblr. A screen shot of NowThisNews.com directs readers to the company’s social media platforms in order to find news. Because each platform is different, the content has to be repackaged in a variety of ways, and that’s something students entering the field will need to know how to do. One recent example is an interview the company did with Vice President Joe Biden, which was edited and used in a variety of ways. “From one interview, you can get 60 pieces of content on 14 different platforms,” said Versha Sharma, managing editor of NowThis News. The trend also means journalism students should begin experimenting now with each of these platforms. At CNN, production work is broken into teams depending on who is good at which platform, said Ashley Codianni, director of social media for the cable giant. This means students can “specialize” in a platform such as Snapchat. “We’re able to make special content and deliver it to people on their platform,” she said. It used to be that journalism professors who teach video spent as much time focused on audio as they did on the moving pictures. While high-quality audio is still a must for students to learn, many mobile video users are consuming video with the sound off. (Think crowded train commutes or sneaky looks at Facebook during work.) Fidji Simo, director of product at Facebook, said during a panel that about half of video on Facebook is consumed without the sound on. That means students need to know how to package video for social, said Misty Montaño, digital content manager for 9News in Denver. “Videos right now really are non-audio, specific for Facebook, 30 seconds or shorter and visual, very visual,” she said. Broadcast students also should be able to adapt to various editing platforms and always understand the fundamentals of storytelling. “You (have to) know what’s behind editing. It’s knowing basic skills,” Montaño said. “We are looking on the digital journalism side for not just your stuffy AP writers, we are looking for journalists who are able to craft and weave a story that is even different from what you see or hear on TV,” she said. Many journalism professors likely have the general sense that there are skills students need to know that aren’t anywhere on a syllabus in their department. Those skills include things on the technical side of storytelling, said Tim Wong, senior director of UX architecture at Gannett. “We have social interns and engagement desk interns and it’s interesting to poke and prod them to think about ways to use these platforms in ways they (usually) don’t and to look under the hood,” he said. During a class he taught at the University of Maryland’s Philip Merrill College of Journalism, his assignments revolved around student projects that included creating new news platforms and tools. “I just feel like learning by doing is such a huge value for journalism schools,” he said. So how can professors add new courses and topics into what they already teach, especially when getting approval for new courses can be time consuming and logistically taxing? Holly Wise, a lecturer at Texas State University, said she’s had luck teaching two-week classes during interim sessions. The offerings at her university have included drones, sensors and solutions journalism. “What I try to do is focus on elements of good, compelling stories, no matter what the platforms is,” she said. Jody Brannon, a former adjunct professor at American University who serves on the ONA executive board and coordinates its Education Committee, said the conference helps educators starting learn about the skills their students will need. “We all know how long it takes for curriculums to change,” she said, so it’s key that educators have a space to collectively brainstorm ways to make journalism programs less traditional. Already, she’s seen educators become change agents on their campuses. “How many Snapchat classes are offered in America this semester? I would say not many, but maybe after spending the week here, there will be next term — if there’s that flexibility and some change agents on campus to make that happen. I’d like to think that people who are here and make that effort to come are those change agents,” she said. Students who plan to work in journalism should know a bit about artificial intelligence and its intersection with news. News outlets including the New York Times, BreakingNews.com and the Today Show already have deployed bots to deliver news and information while BuzzFeed has a bot that gathers news. And more bots are coming — both of the type that interact using text and those that run on voice recognition. While much of bot creation requires substantive coding skills, several platforms exist to help would-be bot makers build and test bots, including ChatFuel, RunDexter and Motion.AI. For students interested in learning more about bots, one place to start is an environment like Slack, which uses bots inside its platform, said Stephanie Clary, managing editor of Breaking News. One easy way for journalism professors to stay up to date is to check out futurist Amy Webb’s top tech trends. Webb presents the trends every year at ONA and her talk is always a fascinating look at the future. This year, Webb showed off two robots. One, named Akira, was created to answer questions about ONA, while another named Amy answered a broader range of questions. This year’s trends include object recognition, crowd learning, mixed reality, conversational computing and augmented journalism. Read this wrap up by student journalists at the conference to get the lowdown on what all that means — and to check out the five other trends in Webb’s report this year. See Webb’s slide deck here. During her presentation, Webb also spoke about the future jobs in journalism, which include augmented reality producers, public editors for code and a data and algorithms investigative team. Stay tuned for next year’s ONA to undoubtedly hear from people doing some of those jobs. Journalism educators who want to show students examples of experiments in innovative storytelling can use CNN as one source. A panel of CNN directors and editors said the company uses a variety of platforms for broadcast, including Facebook Live. One reporter stationed in Rio during the recent Olympics did 32 Facebook Lives, said Codianni, the director of social media. Another reporter used Facebook to go live from a dangerously overcrowded prison in the Philippines. “Being big is just not good enough. We need to be engaging and really modify and create content that people want to consume in the places they want to consume it,” she said. CNN reporters also used the messaging app Kik, Instagram Stories and Snapchat to report and connect with audiences. Kik, she said, is for a much younger audience, and has a different voice and style from other platforms. In short, students should specialize in a social platform they enjoy and could end up with jobs, such as Snapchat editor. They also should be savvy with mobile technology and could end up working at places such as CNN’s first mobile-first bureau in Nigeria. Along with being able to work in a high-tech environment, students should be able to write well, said Amanda Wills, senior editor of CNN’s digital news desk. The company is looking for “people who are not afraid to write with voice,” she said. See other parts of the CNN panelists’ presentation here and check out CNN’s current job listings to get a sense of the skills needed in today’s marketplace. If you and your students are ready for some inspiration, check out the ONA’s 2016 online journalism award winners. The winning student work includes projects by the UC Berkeley Graduate School of Journalism, NYU Journalism, Arthur L. Carter Journalism Institute and the UBC Graduate School of Journalism. The biggest announcement in the journalism educator world at the conference was that more funding will be available for another two years for the Challenge Fund for Innovation in Journalism Education. Nearly $1 million will go to fund between 15 and 20 student journalism projects around the country that aim to produce “live news experiments.” See more here. It seems every year the choices between all the great panels at ONA become harder and harder. Check out the coverage of other panels that may interest you on ONA’s student newsroom site. The student newsroom program is an opportunity for journalism students to attend the conference for free while they work with mentors to cover the event.